I love Nuffnang because it has allowed me to meet so many people and new friends because of the events it organized that I was invited to attend. Nuffnang has allowed me to meet people in the virtual world and follow their lives and adventures and eventually meeting them face to face in affairs and programs and awarding ceremonies. I can still remember my first event, the Goldilocks event which happened almost two years ago. With the two years that I have been a member of Nuffnang, I have forged friendships, expanded my network and participated in several online community activities. The Nuffnang group serves as one of my family here in Manila as I live away from my real family. The fun and belongingness I experience would not replace the feeling when I am with my family but it surely makes being alone more bearable and it allows me to get by with a smile. With the blogs of the people in the online community, I am transported to different dimensions: fashion, travel, sports, and everything in beyond and in between. Not to mention the additional shopping money I earn from the Nuffnang sponsors who advertise in my blog. 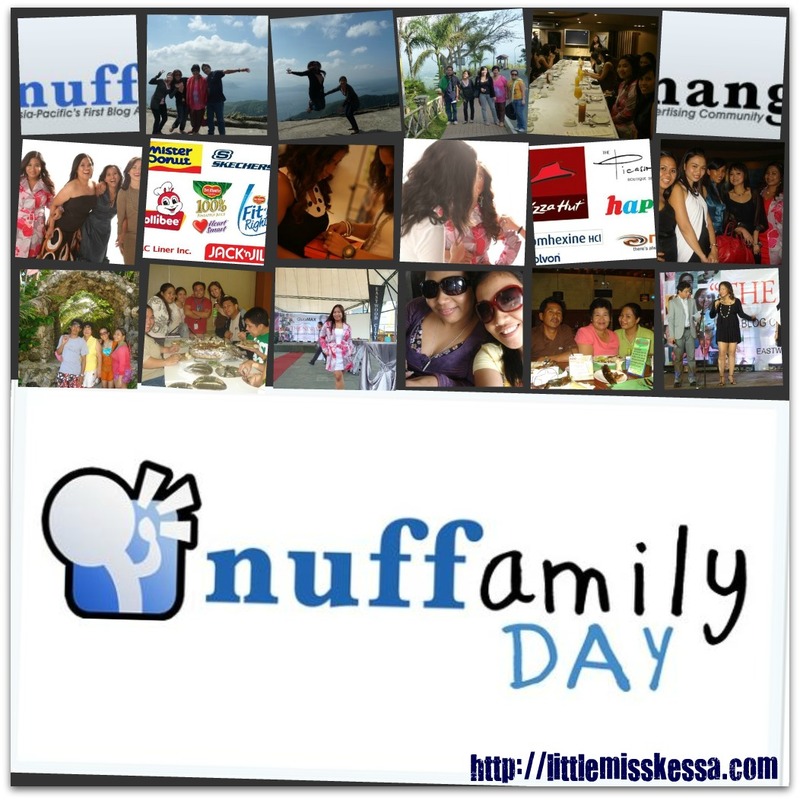 And this May 28, I am more than ecstatic to join the first ever Nuffamily Day at Crosswinds, Tagaytay. Together with 50 other bloggers and their families as well as the staff of Nuffnang Philippines we will all be indulging ourselves in an afternoon of fun and camaraderie as well as the much awaited lantern lifting. I will be bringing three of my friends whom I consider family here in Manila: Uncle Don (mom's cousin), Jonah (my friend from work and my roommate), and Olive (my friend from college until now). It will be fun to share stories and laughters inside the NuffBus on the way to Tagaytay for sure. This event is made possible by the generous sponsors: Pizza Hut, The Picasso Boutique Serviced Residences, Bisolvon, Hapee, Neo, Mister Donut, Skechers, Jollibee, Del Monte 100% Pineapple Juice, Del Monte Fit 'n Right, JAC Liner Inc and Jack 'n Jill.